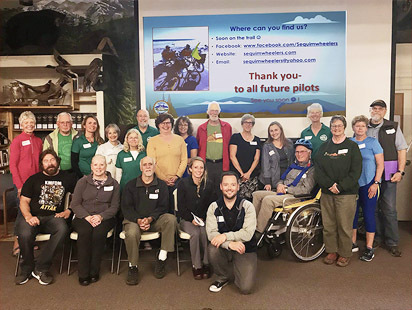 Sequim Wheelers offers free wheelchair bike rides for folks that cannot ride a bike themselves, providing fresh air and sunshine for both riders and volunteers. 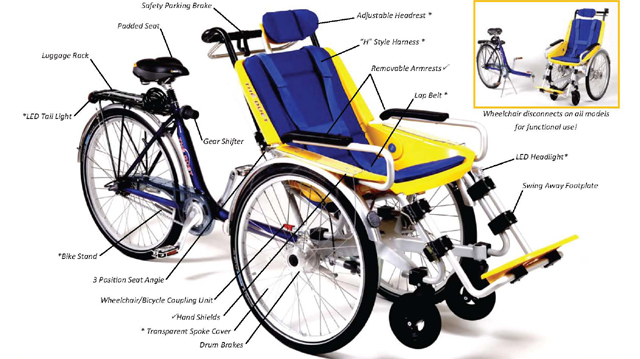 The ability of these types of bike rides to lift the spirits of disabled individuals was documented by Alberta Health Services. It found that the rides dramatically decrease depression, while improving sleep, appetite, and more. We are providing fun rides on the Olympic Discovery Trail in Sequim. All volunteers must be trained and log two trips on the trail before taking out a passenger. A typical ride starts at the Dungeness River Audubon Center. However we work with a number of resident care facilities in Sequim and pick up riders at their locations. If you are interested in a ride, contact us; we may be able to pick you up at your location. The DUET has been safety tested and has passed US and Canadian government regulations. Our guests are unable to ride a bike themselves. The Bike Chair is designed to let someone else do the pedaling while the guest enjoys the view. Our goal is to help others get out on the Olympic Discovery Trail for some fresh air and sunshine. Just sit back and be our guests. Sequim Wheelers does not have the means to get our guests to our loading area, so we ask that you provide your own transportation. People who CANNOT participate are individuals who have postural issues, decubitus ulcers, or other conditions that prohibit them from sitting upright in the wheelchair. Also those with extreme, unpredictable behaviors, and those with acute illnesses.